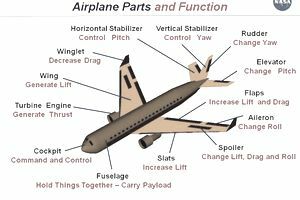 The basic structure and components of an airplane are explained below, including the fuselage, wings, horizontal stabilizer, and powerplant, along with structural materials and frame design. The fuselage is the main part of the aircraft, located centrally to the entire aircraft. It's the area where the passengers and baggage are typically held and the part of the plane to which the wings and empennage are attached. It's basically a large, hollow tube that tapers at the back. The wings are attached to the fuselage on either side. The wings are the source of lift for the aircraft. They are attached near the top of the fuselage on high-wing aircraft like Cessna's 162 and at the bottom of the fuselage on low-wing aircraft, such as the Terrafugia Transition. The front of the wing is called the leading edge and the back of the wing is called the trailing edge. The wing is held together and supported by metal spars, ribs, and stringers and covered by a fabric, aluminum, or composite shell. On the rear part of the wing (the trailing edge), you can find the aileron and flaps, which change the shape of the wing to create more or less lift for different phases of flight. Aileron: The aileron is found near the tip of the wing on the trailing edge. It's a rectangular-shaped airfoil that rises to disturb the airflow over the wing. Ailerons are used to turn the airplane. They work by disrupting the airflow over the wing, which creates more lift on one wing than the other. Flaps: Flaps are smaller airfoils found on the rear part of the wing nearest to the fuselage. Flaps can be extended to increase the wing surface area, creating more lift for takeoff and landing. There are different types of flaps; designs vary by aircraft. Some types include plain flap, slotted flap, split flap, Fowler flap, and the slotted Fowler flap. The empennage consists of the vertical stabilizer (the "tail" of the airplane) and the horizontal stabilizer or stabilator. Rudder: The rudder is a movable piece of the vertical stabilizer that allows the airplane to turn left or right about the airplane's vertical axis when activated. The rudder is connected to the foot pedals in the cockpit of the airplane. Elevator: The elevator is located on the rear part of the horizontal stabilizer. It moves up and down in order to make the airplane's nose move up or down. The elevator is connected to the yoke. If you were to pull back on the yoke in the cockpit, the elevator would be moved upward, forcing the horizontal stabilizer to go down and the aircraft's nose to go up. Stabilator: A stabilator is similar to a horizontal stabilizer but doesn't include an elevator. The stabilator is one large piece of material with an anti-servo tab that doubles as a trim tab. Trim Tab: Trim tabs are small rectangle-shaped pieces of material on the trailing edge of the horizontal stabilizer. They're meant to be moved gradually, as set by the pilot, to ease control pressure and make the aircraft easier to handle. The powerplant consists of the engine and all engine components, the propeller, and electrical system. It can be located on the front of the aircraft fuselage or toward the rear of the airplane. In multi-engine aircraft, the engines are typically located under the wings on each side. The landing gear on most aircraft consists of wheels and struts. Some aircraft have skis or floats in order to land on snow or water, respectively. A typical single-engine land airplane will have either tricycle landing gear or conventional landing gear. Tricycle gear means that there are two main wheels with a nose wheel in front. On aircraft with conventional gear, there are two main wheels with a single wheel in back, under the tail. Aircraft with conventional type gear are often called tailwheel airplanes or taildraggers. Most airplanes are also steered on the ground with the use of a tricycle type landing gear configuration. Aircraft can be made of different types of material and methods, including truss, monocoque, semi-monocoque, and composite material. Truss structure is an older type of structure and is created by welding tubes together to form a rectangular frame. It could be left open or covered by a cloth or metal skin, but is not as aerodynamic as more current methods. Monocoque structures are basically hollow designs with a stretched fabric or material such as aluminum skin over the open framework. It's simple and pretty sturdy around the edges, but the inner parts of the structure can't withstand much external pressure. Semi-monocoque airplanes are designed in a similar fashion as a monocoque, but with added support and a substructure. Composite materials are becoming more popular and are used in modern aircraft frequently. Composite materials are lighter and stronger than traditional aluminum. Composite materials such as carbon fiber and fiberglass are more expensive than traditional materials but are less prone to corrosion and metal fatigue.